Stay Alert - investment scam. We wish to alert you to a scam being committed using the Rathbones name. Find out more information here. Whether you come to us directly or through a professional adviser, your investment manager will first need to establish your circumstances and requirements. Direct contact with the person who will be responsible for managing your money is a vital part of this process. He or she will need to understand your overall level of wealth, lifestyle, time horizon and tax affairs as well as any liabilities you may have. You may be a new investor or wish to transfer an existing portfolio from another investment company. This may also be a good opportunity to consolidate your investments, including ISAs, under a single investment strategy. 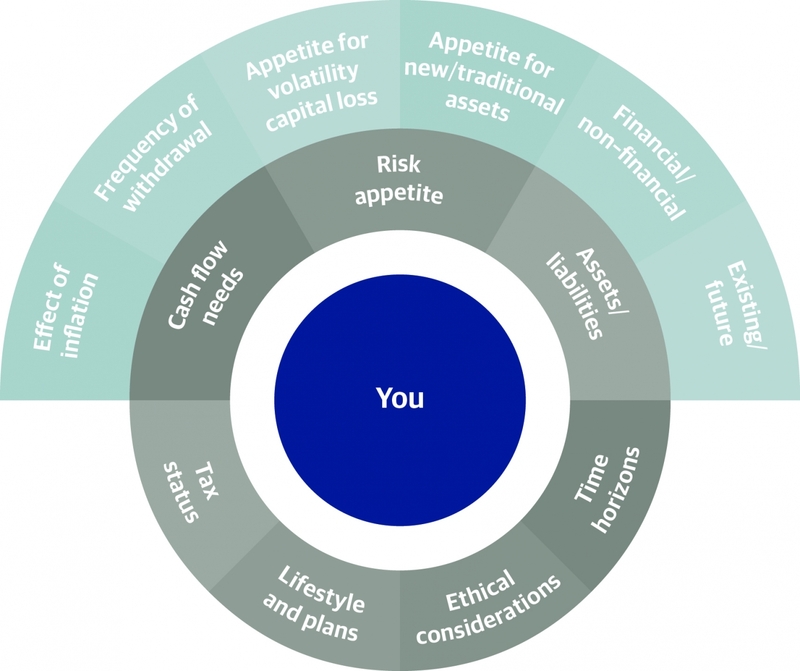 We recognise that every investor has different ethical priorities and financial requirements, and we ask all clients of our bespoke portfolio management service to complete an ethical questionnaire. We then review these preferences with you in more detail and discuss any significant financial implications. Once we understand your situation and objectives, using our investment process we structure a portfolio of investments that offers sound financial prospects while reflecting your values and interests. In doing this, your investment objectives and circumstances, such as your attitude to risk, income requirements and where relevant, tax position, remain of paramount importance. We will actively manage your portfolio to ensure it remains appropriate for the ever-changing conditions in the global economy and financial markets. Your investment manager will also be responsible for making any adjustments if your personal situation or objectives change. A diversified investment strategy (sometimes called a “balanced portfolio” or “multi-asset portfolio”) that combines different assets can be one of the best ways to preserve and enhance wealth over the long term. This approach can provide exposure to a wide set of investment opportunities and reduce losses when market conditions are challenging. Typically, different assets react to conditions in the underlying economy and financial markets in different ways. For example, government bond yields usually rise (and prices fall) if the economy is strong and interest rate increases are on the horizon. Meanwhile, equities, commodities and commercial property tend to suffer when economic conditions are deteriorating. The performance of asset classes and the relationship between them can also be affected by other factors, including central bank monetary policies, regulatory changes and the political climate as well as investor sentiment. Building diversified portfolios and monitoring the investment environment is a complex process that requires extensive resources and expertise. Your investment manager will develop a close working relationship with you or your adviser, starting with a comprehensive fact-finding exercise so that we fully understand your financial situation and requirements. Communication is important and we provide you with timely information. We believe in clear and straightforward reporting through regular portfolio valuations. You can ask us to email or post to you an up-to-date valuation at any time. You can also access your portfolio 24 hours a day through our secure online portal. We have invested in our ability to monitor how your investments perform. The sophisticated, market-leading software that we use enables us to provide you with comprehensive performance data and portfolio information. Our systems also enable investment managers to manage tax issues that may arise in your portfolio and prepare the information needed for tax returns. Given the flexibility enjoyed by our investment managers, effective oversight is very important. As well as the monitoring of investment performance by our investment executive committee, which ensures that returns are satisfactory and consistent with the levels of risk being taken, investment managers also have regular peer reviews for suitability to ensure their portfolios reflect the individual client’s investment requirements and attitude to risk. Direct contact with the person who will be managing your money. We have a well-defined investment process. We have our own in-house ethical research team. We are committed to bringing about positive change through investment. A growing area of interest for a number of our clients. Good work - fair, decent and fulfilling employment in the modern economy. If you would like to know more about our services and how we manage your money, please read our online brochures. If you’d like to learn more about our services please complete our enquiry form.